The Act on Amendments to the Code of Civil Procedure and the Law of Property Act (657 SE), initiated by the Government, which amends the bases for determining the value of an action, was passed with 87 votes in favour. Also, maximum limits are set for the value of an action: in an action for termination of common ownership and division of a thing; in an action for division of joint property and an action for repeal or establishment of the nullity of a resolution of a legal person. The Act amends the regulation concerning the division of the procedural expenses in a proceeding on petition upon review of a complaint against decisions of bailiff and an application for the performance of a notarial act. It also amends the regulation concerning grant of procedural assistance, as well as the regulation of termination of a mortgage on the demand of the owner of an encumbered immovable and changing of the mortgage to an owner mortgage in the Law of Property Act. The International Sanctions Act (632 SE), initiated by the Government, which creates a relevant regulation, efficiently functioning in practice, for application of international sanctions, was passed with 84 votes in favour. 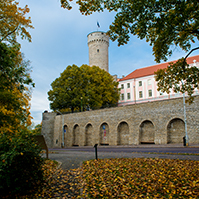 The Act ensures correct application of international sanctions in Estonia without delays. 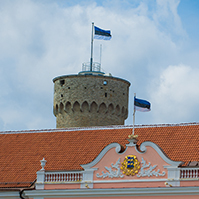 The Resolution of the Riigikogu “The National Security Concept of Estonia” (718 OE), submitted by the Government, was passed with 82 votes in favour. 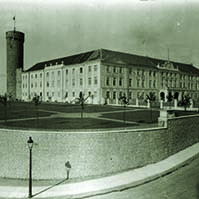 The National Security Concept determines the purpose, principles and objectives of the security policy of Estonia. It is a framework document and the basis for the preparation of development and action programmes in various spheres. 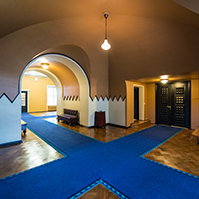 The National Security Concept is changed or amended when the security environment changes and the possibilities for guaranteeing the security of Estonia are clarified. 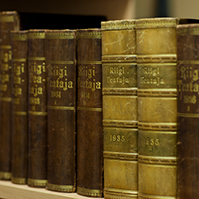 This document replaces the National Security Concept the Riigikogu adopted in 2004. The purpose of the Bill on Amendments to the Ambient Air Protection Act (726 SE), initiated by the Government, is to amend the legal regulation of the emissions trading permitted for states under Article 17 of the Kyoto Protocol and implementation of the Green Investment Scheme. The Bill on Amendments to the Packaging Excise Duty Act and the Packaging Act (707 SE), initiated by the Government, provides the time of entry into force of the contract entered into between the payer of excise duty and the packaging recovery organisation, and the prohibition to retroactively transfer the obligations provided by the Act. Packagings taken on board of water craft or aircraft carrying out international travels will be exempt from deposit. The Bill also specifies the classification of packaging material. TheRiigikogu suspended the second reading of the Bill on Amendments to the Savings and Loan Associations Act and Associated Acts (240 SE), initiated by the Government. The Bill eliminates the restrictions which hinder the development of savings and loan associations and also adjusts the requirements for the financial soundness of savings and loan associations. The Bill on Amendments to the Human Genes Research Act (741 SE), initiated by the Government, amends the provision which regulates the procedure for withdrawing the consent of a person to become a gene donor, and an amendment concerning technical norms is made to the Act. The Bill brings the procedure for withdrawing the consent of a person to become a gene donor in the Human Genes Research Act into conformity with the principles of the Personal Data Protection Act. The purpose of the Bill on Amendments to the State Borders Act and the Administrative Cooperation Act (749 SE), initiated by the Government, is to provide objectively measurable requirements for organisation of the entry of vehicles to road border points and for the waiting area of border crossing. The Act also sets out the principles of the organisation of the border crossing waiting list and provides that the data necessary for maintaining a border crossing waiting list are to be processed in the database of the border crossing waiting list. The Bill on Amendments to the Weapons Act (730 SE), initiated by the Government, provides and enforces the legal provisions necessary for the observance of the relevant European Union directive. It also resolves the problems which have emerged in practice in connection with handling of weapons. The amendments specify control measures with regard to circulation of weapons and grant a possibility to be flexible upon suspension of a weapons permit and to suspend a weapons permit on the basis of an objective danger which may arise from a person. The Bill on Amendments to the Animal Protection Act (745 SE), initiated by the Government, is necessitated by the relevant Council of the European Union directive laying down minimum rules for the protection of chickens kept for meat production which can be harmonised only after bases have been established by the Act. In addition, it is necessary to specify the text of the Act for elimination of the deficiencies which have become evident in practice (training of experimenters) and to update the text of the Act and a note concerning technical norms in connection with amending of the European Union legislation (prohibition on performance of animal testing in case of cosmetic products). 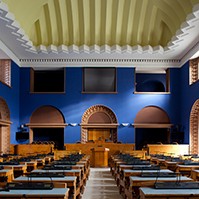 The Bill on Amendments to the Plant Propagation and Plant Variety Rights Act, the Rural Development and Agricultural Market Regulation Act and the State Fees Act (746 SE), initiated by the Government, transposes into the Estonian law the relevant European Union Council directive on the marketing of fruit plant propagating material and fruit plants intended for fruit production which entered into force in autumn 2008. At Question Time, the Minister of Social Affairs Hanno Pevkur answered the question about the responsibility of the Minister, submitted by Kadri Simson, the question about the situation of social welfare and health care, submitted by Marika Tuus, and the question about emigration of health care professionals, submitted by Nikolai Põdramägi. The Minister of Agriculture Helir-Valdor Seeder answered the question about fisheries quota established for coastal fishermen, submitted by Mark Soosaar. The Minister of Education and Research Tõnis Lukas in the capacity of Prime Minister answered the question about the kindergarten problems in Tallinn, submitted by Lauri Vahtre, and the question about the development of schools network, submitted by Kaia Iva.